Satan's much smarter than Eve. She didn't…wasn't even in the picture. But she wasn't supposed to be smart, she was supposed to be obedient. We're not supposed to be smart. Jesus said the children of this world, or, the kingdom of this world is much smarter, the children of darkness than the children of Light. We are likened to sheep. Sheep can't even lead themselves, they've got to have a shepherd. 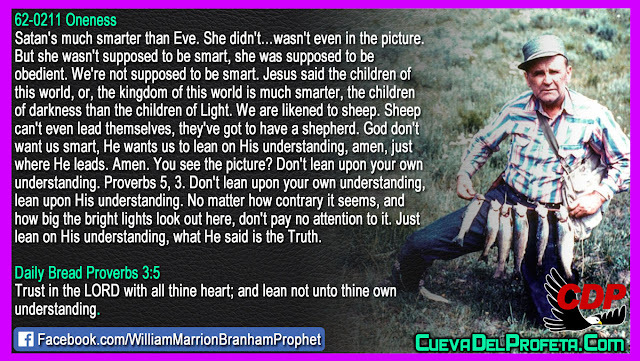 God don't want us smart, He wants us to lean on His understanding, amen, just where He leads. Amen. You see the picture? Don't lean upon your own understanding. Proverbs 5, 3. Don't lean upon your own understanding, lean upon His understanding. No matter how contrary it seems, and how big the bright lights look out here, don't pay no attention to it. Just lean on His understanding, what He said is the Truth.